Information missing - contribute to MMA, by filling this information using the left menu member zone link "Edit album infos". This function is only available to MMA Collabs. 0 results found for "tardigrade inferno"
Coming from the musically rich city of St Petersburg, Russia is the extraordinarily zany and creative band TARDIGRADE INFERNO which formed somewhere around 2016 and released one self-titled EP and has been somewhat quiet for a few years. The year 2019 has barely had time to warm up and the band finally unleash the very first debut full-length MASTERMIND which displays the band’s unique mix of alternative metal with dark cabaret circus music. Add in sprinklings of death metal, thrash and power metal and you have one of early 2019’s most promising new acts. The word “TARDIGRADE” can refer to either a variety of slow-moving microscopic invertebrates or it can simply be an adjective that means slow-moving or slow in action. I have no friggin’ idea how this applies to this band since this is high energy metal and there is relatively little info about this band on the net as i can’t even find any sort of biography whatsoever, however i can say that this band has found a unique sound right off the bat. However if i had to compare TARDIGRADE INFERNO to any other band it would definitely be Diablo Swing Orchestra as it has the same cartoonish feel and the singing style of lead vocalist Darya Pavlovich sounds a lot like both AnnLouice Lögdlund and Kristin Evegård of DSO. Musically though this band doesn’t break out the jazz instrumentation or even circus accordions but rather delivers a metal music heft piled on top of dark cabaret and circus melodies alongside the bouncy festive rhythms that are associated with the greatest show on Earth. The metal bombast is mostly carried out by the power chord slapping staccato style accompanied by circusy keyboard runs but different metal variations come into play however mostly in an alternative metal down-tuned power chord rampage. While Darya Pavlovich’s vocal range stays more in clean vocal cabaret mode, she occasionally screams in metal style reminding me of Arch Enemy for short stints but unfortunately not nearly enough! The circus bounces are always under the surface despite heavy metal thunder stomping fast numbers or slower subdued moments. While i’m constantly reminded of Diablo Swing Orchestra, TARDIGRADE INFERNO isn’t nearly as daring and out there and is rather restrained in comparison. While the music is definitely quirky and playful it doesn’t change the sound up nearly often enough although there are moments such as on the title track where death growls and guitar solos enter the picture, otherwise Darya is pretty much on cutesy Gwen Stefani mode and reminds me a bit of the 90s band No Doubt only with more metal bombast. While a band to look out for as the members become more comfortable with this stylistic fusion approach, this debut is a great start with elements of ska, gypsy swing and the dominant dark cabaret sounds keeping the album infectiously catchy and light-hearted without skimping on the metallic angst. 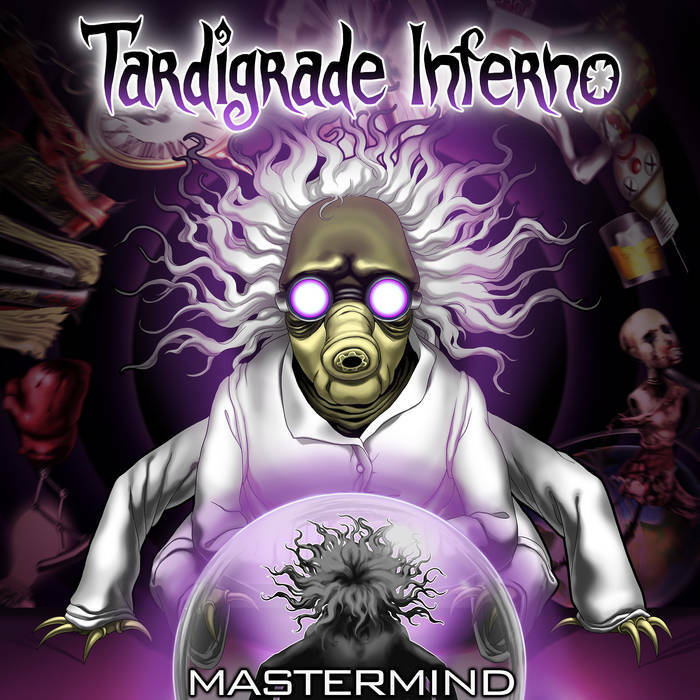 No TARDIGRADE INFERNO MASTERMIND reviews posted by members yet. No TARDIGRADE INFERNO ratings only posted yet.